Glow Little Glow-worm, glimmer glimmer just like the celebs! Did you ever remark that some people have that glow about them? Well, you don’t have to get pregnant to exude that. 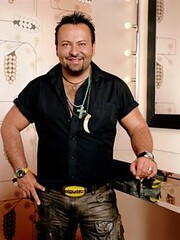 Coming from Down Under this Australian-born artist , Napoleon Perdis, has brought glamor back to Hollywood. Catering to many celebs, he developed his new NP Set line forTarget this past summer. Markdown Mom has tried his Liquid Veil, $14.00, that adds that special pearlized highlights to your face–you may want to add it to your shoulders for an extra sparkle when you wear shoulderless tops/dresses! Try his entire line offered online at Target. Moderately priced for that expensive Hollywood glam look. Create Your Own Golden Globes!! !